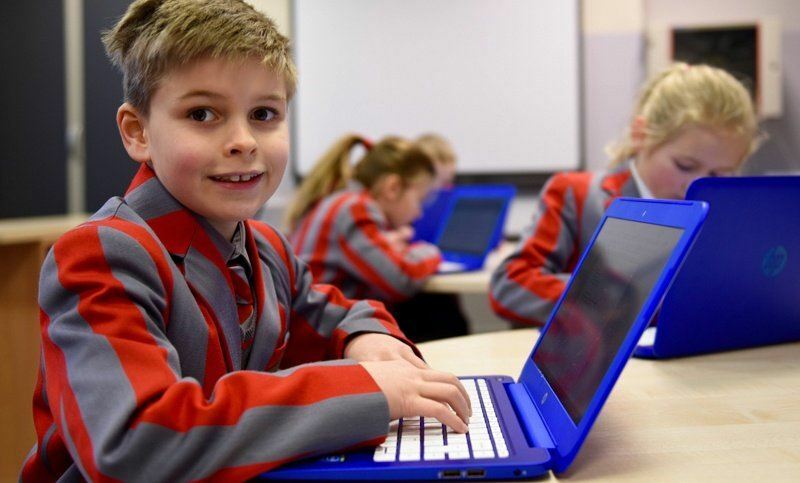 The aim of the curriculum is to build an understanding of how computers work and how they can be used in pupils’ lives – both in their future employment and in enabling them to be good 21st Century global citizens. The Curriculum develops both skills and knowledge. Children are taught computer science. This includes the craft of coding, from KS1 onwards – floor and screen turtles at KS1 to Scratch at KS2. Children learn about programming, data, algorithms and networks. This enables children to develop an understanding of the principles of computer science. They develop computational thinking. There’s also a focus on problem solving: using logic and ideas about systems, patterns (and pattern languages), abstraction and decomposition. Abstraction – Reducing complexity by focusing on the essential features of an algorithm or data representation and omitting unnecessary detail. Algorithm – A precise step by step method for solving a problem. Application – A self-contained program that performs a specific function for end users. Boolean logic / digital logic – A system of reasoning with truth values, true and false, using logical operations such as and, or, and not. Browser – A piece of software that enables a user to locate, retrieve and display information on the world wide web. Complexity – The way that a solution to a problem scales as the size of the input increases, considering both the number of computational steps and the memory space required. Computation – Performing a calculation by executing the instructions of a program on a computational device. Computational device / digital device – A computer or other programmable device that performs computation. Computational thinking – The ability to analyse ways to solve problems using appropriate algorithms and data representations, taking account of the complexity of possible solutions. Computer science – The scientific study of computation, applied to both hardware and software, covering both theoretical and practical concerns. Data – Information which can be stored, retrieved and manipulated in digital form using digital devices. Debug – To find, remove and / or change errors in computer code. Digital artifacts / digital content – Images, videos, text or data, or a combination of these, which are made on a digital device. Digital literacy – The ability to access and manipulate digital content and understand the implications of its creation and distribution. Data representation – The various ways data can be represented as words, numbers and pictures in the memory of a computational device. E-safety – Understanding and applying rules to mitigate against the risks to personal safety and privacy of personal information in using digital devices of all kinds. Function – A small section of computational code that performs a specific operation. In particular, a function takes inputs, or arguments, and returns outputs, or results. Input – The data that feeds into a computation. A stimulus to which a real-time application will respond. Internet – A global network of computers which are linked, allowing the exchange of data. It uses various data transfer protocols which can be seen in the top bar of a browser, such as Hyper Text Transfer Protocol (http). Logic – A systematic approach to reasoning. The rules that underlie an algorithm used for an application. Can also refer to digital components in computer hardware. Network – A number of computational devices connected together, allowing sharing of resources and cooperation between devices in the solution of a problem. Also the hardware used to establish connections between devices on a network. Operating system – The program that enables the computer to start and access different sorts of software on the computer, examples include Microsoft Windows and iOS for Mac. Output – The data that results from a computation. A response generated by a real-time application to stimulus. Procedure – A small section of computational code that performs a specific operation. Unlike a function, a procedure does not return a result but may be to change the data stored in objects in computer memory. Program / code (verb) – To create or modify a program. Program / code (noun) – A sequence of instructions for a computational device, written in an appropriate programming language, for implementing an algorithm that manipulates appropriate data representations for solving a problem. Programming language – A formal language for representing statements, or commands, and data values used in a program. A programming language has a precise syntax that defines the valid ways for combining the symbols used to denote variables and data values. Examples used on schools include Scratch, Python and SmallBASIC. Search technologies – Algorithms used by applications known as search engines to trawl the internet for digital content matching search terms given by a user. Results are normally presented in the form of links to relevant content. Sequence – A number of program statements, to be executed one after another. Software – The programs that enable computers to undertake specific functions. Variable – A symbol in the code for a program that represents a data value or data object that can be changed during the course of computation.